Schism Tracker is a free reimplementation of Impulse Tracker, a program used to create high quality music without the requirements of specialized, expensive equipment, and with a unique “finger feel” that is difficult to replicate in-part. The player is based on a highly modified version of the Modplug engine, with a number of bugfixes and changes to improve IT playback. 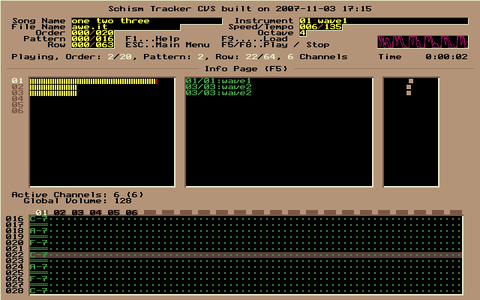 Where Impulse Tracker was limited to i386-based systems running MS-DOS, Schism Tracker runs on almost any platform that SDL supports, and has been successfully built for Linux, Mac OS X, Windows, FreeBSD, AmigaOS, BeOS, and even the Wii. Most development is done on x86 (ia32, amd64/ia32e) and ppc (both the ppc32 and ppc64 flavors). Schism will most likely build on any architecture supported by GCC4 (e.g. alpha, m68k, arm, etc.) but it will probably not be as well-optimized on many systems.